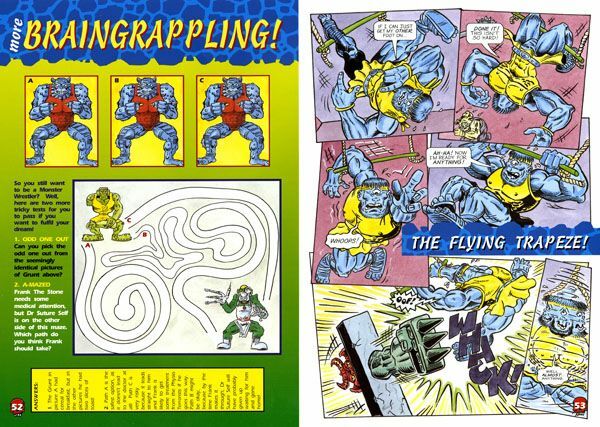 The concept behind 'Monster Wrestlers In My Pocket' started off life as with most of the comics in the UK nowadays as a toy. The idea behind the concept was to cash in on the rising popularity of the WWF characters in the states on TV amongst the kids. There were lots of the characters all of them quite weird...just what the kids ordered. They could buy sets of them or single figures. They had rings and strange torture chamber-like looking training devices too. The kids loved them! It was like a cross between American style 'over the top' wrestling meets Universal Pictures' Monster Movies. Tim loved the book and thinks his work on it stills holds up today. "I just seemed to get the style right straight away." The book was wanted out fast as seems the norm. The deadline was one month from start to finish for the annual to go to print so Tim employed the services again of Leo Brown and Simon Clegg to partly colour and ink any pages Tim couldn't manage in the time frame. Leo did some of the colouring, whilst Simon did some of the inks and some of the colouring. Tim Pencilled all of the strips bar one, which was given to the guy that created the concept, John Moore. Tim also inked all of the strips and inked some of the other illustrations. He also coloured all of the strips and some of the illustrations. It was a pity there was never a follow up of the annual as a comic book. Tim was unable to find any copies of the book except a complimentary copy from Newsstand anywhere, which he feels may have either added to the fact there was never a comic after it came out, due to no one knowing it existed or else it was very popular. It would be nice to think that the latter was true, but Tim is not so sure it's not the first. The artwork was unfortunately never returned and Tim pencilled and inked directly onto the watercolour paper with this commission to save time, so has no original artwork at all.